It forms the anteroinferior part of the hip bone and the anterior one-fifth of the acetabulum, forms the anterior boundaiy of the obturator foramen. It has (1) a body anteriorly, (2) a superior ramus super-olaterally, and (3) an inferior ramus inferolaterally. This is flattened from before backwards, and has (1) a superior border called the pubic crest, (2) a pubic tubercle at the lateral end of the pubic crest, and (3) three surfaces, viz. anterior, posterior and medial. The pubic tubercle is the lateral end of the pubic crest, forming an important landmark. The anterior surface is directed downwards, forwards and slightly laterally. It is rough supero-medially and smooth elsewhere. The posterior or pelvic surface is smooth. It is directed upwards and backwards. It forms the anterior wall of the true pelvis, and is related to the urinary bladder. The medial or symphyseal surface articulates with the opposite pubis to form the pubic symphysis. It extends from the body of the pubis to the acetabulum, above the obturator foramen. It has three borders and three surfaces. The superior border is called the pectineal line or pecten pubis. 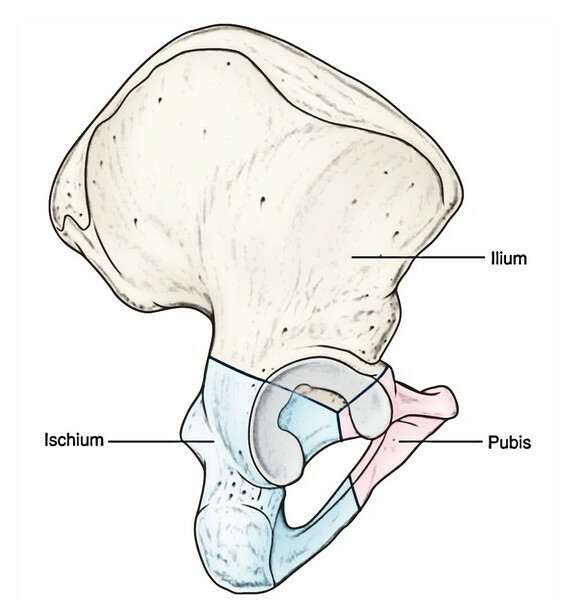 It is a sharp crest extending from just behind the pubic tubercle to the posterior part of the iliopubic eminence. With the pubic crest it forms the pubic part of the arcuate line. The anterior border is called the obturator crest. The border is a rounded ridge, extending from the pubic tubercle to the acetabular notch. The inferior border is sharp and forms the upper margin of the obturator foramen. The pectineal surface is a triangular area between the anterior and superior borders, extending from the pubic tubercle to the iliopubic eminence. The pelvic surface lies between the superior and inferior borders. It is smooth and is continuous with the pelvic surface of the body of the pubis. The obturator surface lies between the anterior and inferior borders. It presents the obturator groove. It extends from the body of the pubis to the ramus of the ischium, medial to the obturator foramen. It unites with the ramus of the ischium to form the conjoined ischiopubic rami. For convenience of description the conjoined rami will be considered together at the end. 1. The pubic tubercle provides attachment to the medial end of the inguinal ligament and to ascending loops of the cremaster muscle. In males, the tubercle is crossed by the spermatic cord. 2. The medial part of the pubic crest is crossed by the medial head of the rectus abdominis. The lateral part of the crest gives origin to the lateral head of the rectus abdominis, and to the pyramidalis. 3. The anterior surface of the body of the pubis provides (a) attachment to the anterior pubic ligament medially, (b) origin to the adductor longus in the angle between the crest and the symphysis, (c) origin to the gracilis, from the margin of the symphysis, and from the inferior ramus, (d) origin to the adductor brevis lateral to the origin of the gracilis, and (e) origin to the obturator extemus near the margin of the obturator foramen. 4. The posterior surface of the body of the pubis provides (a) origin to the levator ani from its middle part, (b) origin to the obturator internus laterally, and (c) attachment to the puboprostatic ligaments medial to the attachment of the levator ani. 5. The pectineal line provides attachment to (a) the conjoint tendon at the medial end, (b) the lacunar ligament at the medial end, in front of the attachment of the conjoint tendon; (c) the pectinate ligament along the whole length of the line lateral to the attachment of the lacunar ligament, (d) the pectineus muscle which arises from the whole length of the line, (e) the fascia covering the pectineus, and (f) the psoas minor, which is inserted here when present of the lacunar ligament, (d) the pectineus muscle which arises from the whole length of the line, (e) the fascia covering the pectineus, and (f) the psoas minor, which is inserted here when present. 6. The upper part of the pectineal surface gives origin to the pectineus. 7. The pelvic surface is crossed by the ductus deferens in males, and the round ligament of the uterus in females. 8. The obturator groove transmits the obturator vessels and nerve.